The vibrant blooms of Hydrangea macrophylla color the garden from mid-summer through fall. This deciduous shrub, commonly called bigleaf hydrangea, is easy to grow if you keep a few cultural tips in mind. Hydrangeas have big bold leaves and large flower clusters. Place bigleaf hydrangeas in a protected area of the yard that receives morning sun and afternoon shade. Exposed full-sun locations cause droopy leaves and scorched flowers. 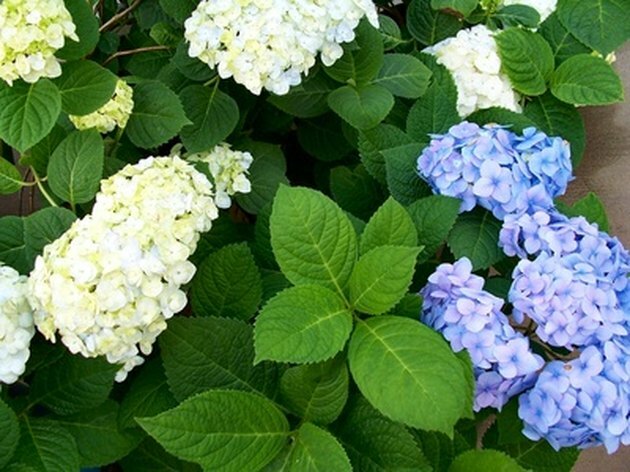 Provide hydrangeas with moist, well-drained soil that contains ample organic matter. Add a 2- to 4-inch layer of compost at planting time. 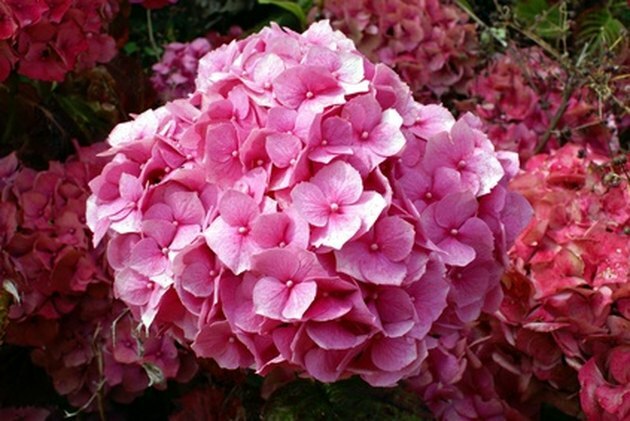 Hydrangea flower color is determined by the soil's pH. In general, acid soils (between 5.0 pH and 5.5 pH) produce blue flowers while alkaline soils (6.0 pH and higher) create pink flowers. The hydra in hydrangea means water in Greek. Keep hydrangeas consistently moist. During dry spells, soak them once or twice a week. Apply a 2- to 3-inch layer of mulch to retain moisture and suppress water-guzzling weeds. Feed bigleaf hydrangea throughout the growing season. Clemson University suggests using a general-purpose fertilizer, such as 10-10-10, in March, May and July. Bigleaf hydrangea blooms form on wood grown the previous year. Prune right after flowering so the plant can develop the required "old wood" to produce blossoms the following year.